We left Lodi and headed to the hills towards Yosemite. Nice day for a drive, but I did not do a lot of research into our route. It seemed pretty straight forward, just go east and you will get there. We traveled mostly back roads or 2-lane highways, a couple areas were nice and open, one or two were not so much. The real “fun” began when we started to head up the hill on Hwy 120. Again we got the signs that the road was not recommended for large vehicles, but there is only one road in and out of the area from here, so up we went. (There is actually another road up for cars-only which the locals know about, but we could not go in the MoHo). Straight up 5 miles of 15 and 20 mph corners on the side of a canyon, super slow going for sure. These are the roads that Traci hates, and I have to really concentrate, as there is very little room for a mistake. Then you put very few pullouts along the way and you get lots of upset drivers behind us pushing us to go faster, sorry folks, but we are not a Ferrari! We got to the top of the hill and finally it eased up a bit toward Groveland. We traveled another 17 miles to the campground at Thousand Trails Yosemite Lakes. 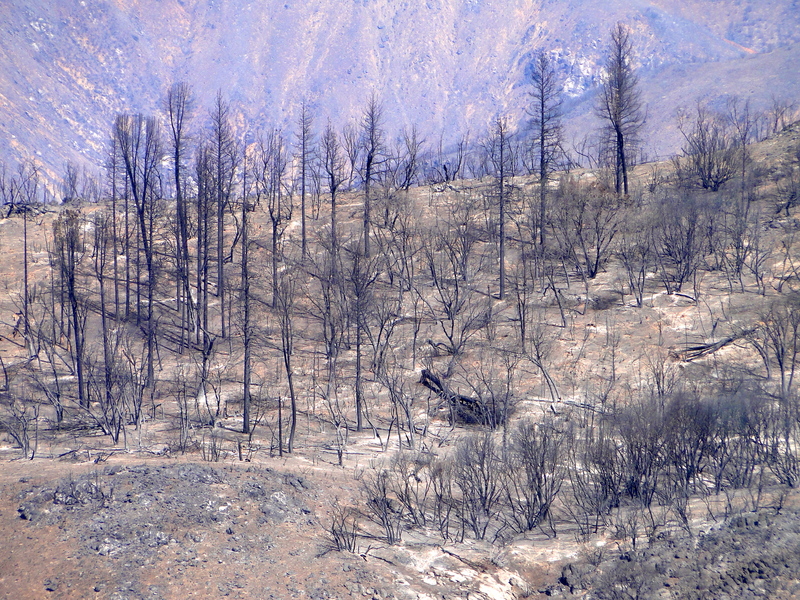 Along the way we started to see some of the devastation from the fires this summer, and it really is sad. It seemed that every road leading off the highway was closed, and there were piles of fallen burnt trees in every pullout or viewpoint. The fire crews were still very present in the area working on hot spots and cleanup. GPS wanted us to turn down one of these closed roads, we couldn’t, so we just kept going for another mile and there was a much better entrance road to the campground. We arrived for our four-night stay and got set up and relaxed with a cold one, the drive was short, but technical. The next day we were off to Yosemite National Park (we would normally link to the NP page, but with gov’t shutdown, the websites are all down); got to the gate about 9:45AM. The ranger at the gate asked for our park pass, and warned us the park may be closed tomorrow…huh?! (I had the TV on that morning and heard something about a govt. shutdown, and now it was making sense.) She said the park would be closed if the govt. shutdown occurs the next day. Fine, whatever lets just get in and go explore. (Political rant here…come on you children, get your act together and figure this out! It seems like someone wants to take their ball and go home and not let the rest of the kids play, absolute joke! If I had my choice, all of those people in politics would only get to serve 2 or 3 terms total, for their entire lifetime, no more career politicians, it just does no good for the long term.) We drove into the park and headed to the Yosemite Valley, as we were hoping to be able to explore more of the park later in the week if it was open. We got to see our first sightings of El Capitan and Half Dome, massive to say the least! 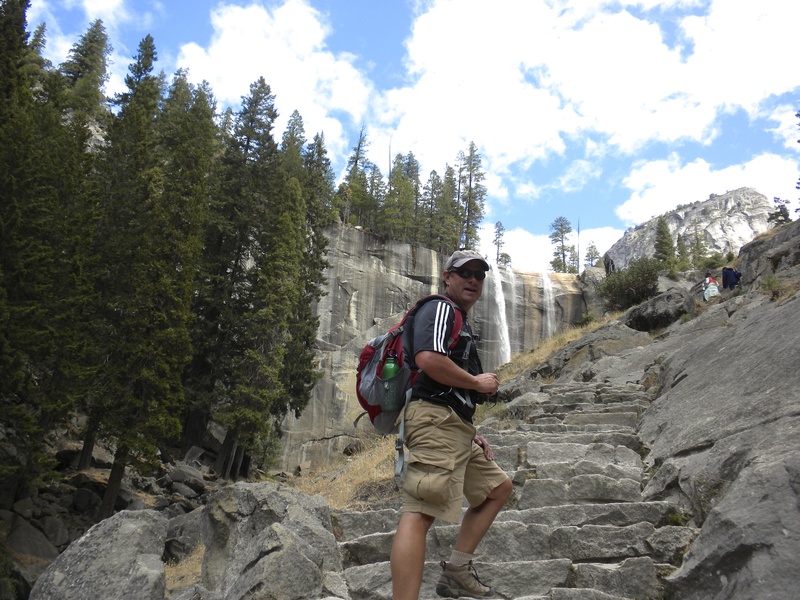 We parked and decided to take a hike up to Vernal Falls, a short 2.4 mile round trip, but 1,000 foot elevation gain. A nice paved path leads up the side of the hill. We got to the bridge and we both wanted to continue to the falls, but it was a bit of a climb to here. (There is a note on the hiking map, the last half-mile is up a granite wall of over 600 steps, and it may be wet with water spray from the falls depending on the time of year.) It was dry, but oh my goodness was it straight up! We both took several breaks on the way up, as it was a lot more than 600 steps. We finally got to the top and were tired, so we spent some time relaxing in the sunshine and had some lunch we packed in. The view was amazing up top and completely worth it, but we were dreading the descent back down those same steps. Coming down is always way more difficult, as you have to control your movements or you could tumble. We got down some 100-150 stairs and both of us already had jelly legs, and our balance was not good. We powered through it and knew we were going to be sore the few days, but had no other choice to get back down. Even the last portion that is paved is really challenging as we were exhausted, and our legs were spent. We hadn’t hiked in awhile and our bodies were feeling it! A.G.E. We headed out of the park with a quick stop at El Capitan to watch a few of the mountain climbers on the rock wall doing their crazy thing on the granite face. (You have seen the pictures of this type of climbing I am sure, but if not Google it and you will see why my camera could not even pick them up). Back to the MoHo for spaghetti and wine, we were in bed by 9:30PM exhausted. Hike up 600 granite steps! 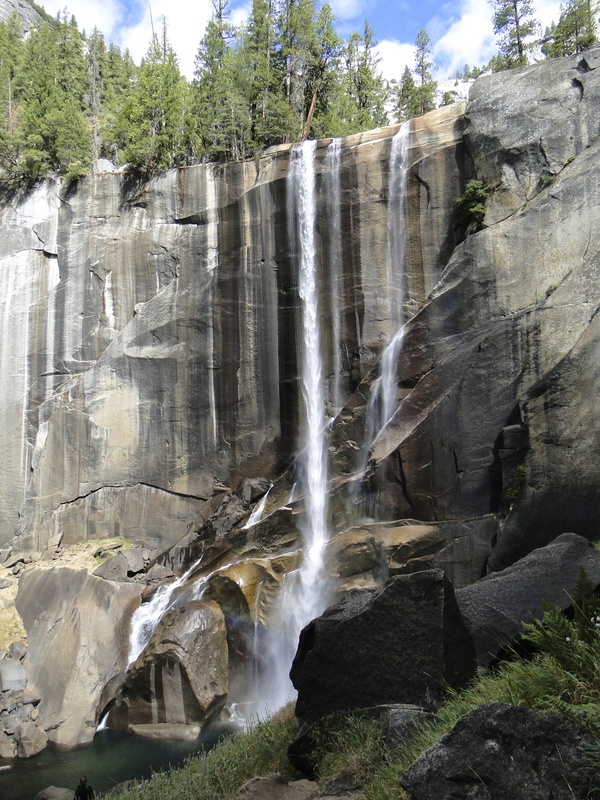 Vernal Falls – this was halfway up. We ended up at the top of the falls. 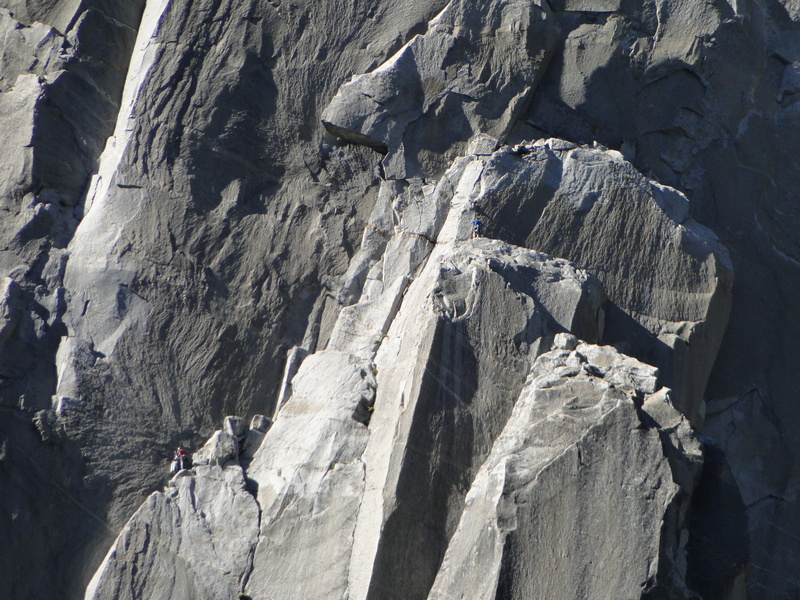 Look closely (click on photo to make larger) – there is a climber in blue near top right and a climber in red bottom left. Crazy! The next day we were stuck, as we figured. We had stayed up late the night before long enough to watch the news channels and find out that the govt. was closing all the national parks. This was really too bad as there was so much more of the park that we wanted to explore. I guess we were fortunate though to have spent one day here as our neighbors traveled from England and didn’t get the chance to go in. We stopped by the campground office to find out if we could get a refund if we left a day early since there really isn’t much to do here with the park closed. There was a sign right inside the door, no refunds for early departures. Great, we can at least ask, right? I think we caught the manager at the right time, as he let us cut our stay a day short, just fill out some paperwork and he will give us refund due to the park closure. We headed back into Groveland for some cell service and lunch. We ate at the Iron Door Saloon – the oldest continuously running Saloon in California, open since 1852. Back to the MoHo for the rest of the afternoon. We took a venture around the area to see how close the fires got to the place, amazing work done by the firefighters to save this campground. Dinner in and another early night, bodies were still revolting against us from our hike the day before! Heading to San Jose area tomorrow, our base for the weekend of golf and two college football games to attend on Saturday; WSU @ Cal. at 1:00PM in Berkley, and the UW @ Stanford at 7:30PM in Palo Alto. Going to be a busy weekend! p.s. I think the ants are gone! Here are more pics from Yosemite. Notice the ones showing the fire damage and look very closely at the ones that just look like a closeup of the mountain – there are actually rock climbers on the face! 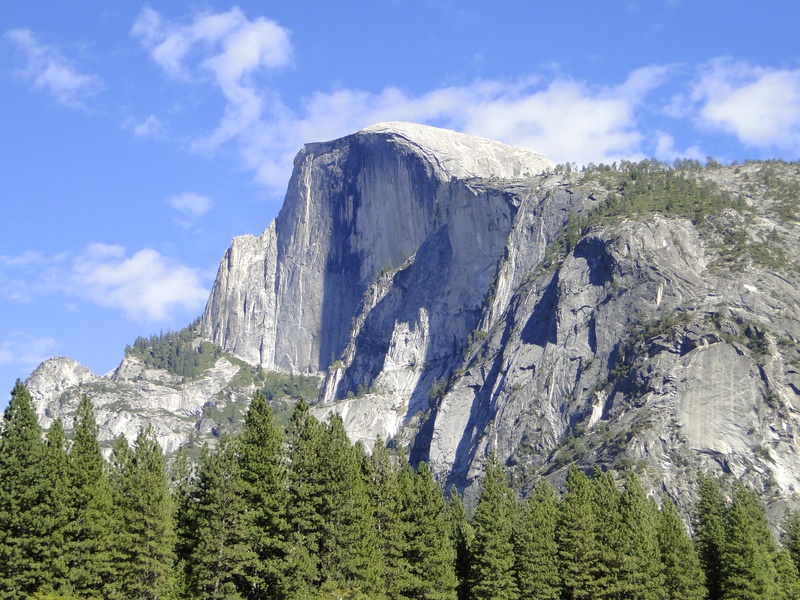 This entry was posted in October 2013 and tagged El Capitan, fires, Government shutdown, Half Dome, hiking, Iron Door Saloon, Yosemite National Park on October 2, 2013 by Mike.